Appearance - Mice are rodents, usually between 10 and 20 centimeters long. They are fur covered and may be grayish or brown depending on the type. Mice do have hair on their tails, although it is shorter and finer than that on their bodies. 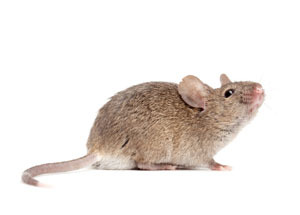 Behavior - Some of the first signs of a mouse infestation could be mouse droppings or a urine smell. Mouse droppings are about the size of a grain of rice and black in color. They will enter homes in the colder months seeking shelter and food. Pantry items eaten in cabinets, chewed paper, and other damaged paper products potentially used for mouse nests could be a sign of a mouse problem. Mice will have babies two to four times a year. Depending on the season or weather, mice will enter your home to keep warm, seek shelter or find a place to start a very large family. Homes and their foundations offer many things mice need such as food, items to create a shelter or nest and simply a place to be left unharmed. If you have holes in your walls or foundation, these may be convenient entrances for mice to seek shelter and reproduce, quickly creating mice infestation problems. First and foremost, mice can reproduce quickly. Just having two mice living within the walls of your home can spawn 40 offspring in a year. Now multiply that by each new offspring, and you will have a massive headache. Mouse droppings can carry dangerous bacteria and viruses. Exposure to mouse droppings can lead to salmonella, ticks carried by mice can lead to Lymes disease, and fleas from mice can cause allergic reactions and rashes. Property damage can also become an issue as mice chew up your furniture, clothes and even the wiring in your home- leading to costly electrical repairs. You may think a quick fix is putting poison down, but that is not a permanent fix and can be risky in it, especially if you have children or pets. Calling us to perform professional mouse control can ensure the mouse problem will not present itself at your home again.